Nestled amidst the foothills of the Blue Ridge Mountains and just 40 minutes north of Atlanta’s I-285, Lake Arrowhead offers serene natural beauty, a host of world-class amenities, and a quality of life that is unlike any other community. Here, great care is being taken to preserve the natural beauty and ecological balance of this unusually pristine residential setting. 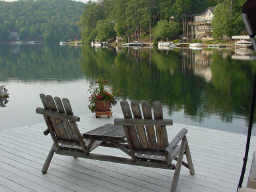 The centerpiece of this waterfront community is, of course, our beautiful 540-acre lake—azure blue pure mountain stream-fed water—one of the largest privately owned man-made lakes in Georgia and also ranked one of the cleanest in the state. The Highlands Course, an 18-hole championship golf course with practice facilities and a 10,000 sq.ft. clubhouse with indoor and outdoor dining.